Pu-erh is one of those teas that can take multiple infusions and is often infused in smaller amounts. A lot of pu-erh is sold in large cakes where you have to break off a chunk to steep it. Some is sold in mini cakes (“tuochas”), which are sized about right for a small pot of tea. 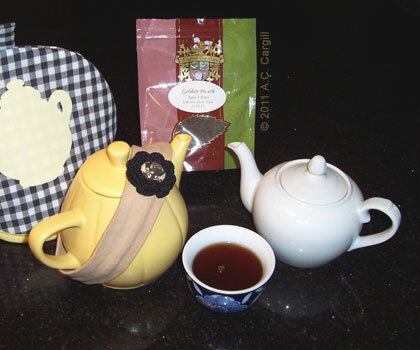 Recently, though, pu-erh has become available loose and even in teabags. For many of you, buying pu-erh loose in a pouch or tin may not seem kosher. However, the era of buying big cakes may be fading, especially as pu-erh gets more known and liked among tea drinkers — both veterans and newbies alike. I’ve been taking a pretty unorthodox approach to pu-erh, steeping longer than usual times, adding in cocoa powder, etc. So, steeping a loose pu-erh is right up my alley. Golden Pu-erh Loose Leaf Tea is one I tried a few months ago, with satisfying results. We opened the wonderful plastic pouch and took a moment to smell the tea leaves, which were large pieces and had an aroma that was earthy yet sweet, not the damp half-composted leaves on the forest floor aroma of some other pu-erhs we have tried (not a bad aroma – just pointing out that this one is different). Some people do a quick rinse of the leaves (about 30 seconds) and then dump out the liquid, but we chose not to. This meant that the first steep was more of a preparatory steep but was still drinkable. The liquid color was a dark reddish brown with an aroma that was earthy yet caramelly and a taste that was smooth and earthy with no bitterness. The second steep was the best, with a richness that the first one didn’t have yet still smooth and free of bitterness. The third and fourth steeps were both lighter overall, with the third having a gritty quality to the flavor (though not to the mouth feel) and the fourth being pretty faint in both color and flavor. Not a bad yield, and one that makes the price per cup quite reasonable (18.75 cents per cupful as of the writing of this article). Be wild. Be experimental. Go for some Golden Pu-erh!